We have finally gotten this completed and if you are up for ten minutes of headseas, click here. Note that most of what you will see is in short, steep waves, a worst case scenario for motion. This entry was posted on Wednesday, December 29th, 2010 at 12:03 pm and is filed under FPB 64 Videos. Both comments and pings are currently closed. I had the very good fortune to be aboard Wind Horse with Steve and Linda on their recent transit from St Lucia to Fort Lauderdale. I have also had the very good fortune to be aboard Avatar and Sarah Sarah during their sea trials in NZ. My wife and I have the even better fortune to be the owners of Iron Lady – FPB64-3 – soon to be launched. On the transit from St Lucia, we traveled thru the Mona Passage and then up thru the Old Bahama Channel along east side of the Bahamas bank and then north over the Gulf Stream towards Florida. The forecasts were pretty consistently showing north to northeast winds over the stream at 10 to 20 knots. Never a good thing for those who have been there – north winds against a north flowing current at 2 knots builds short steep seas. As the winds were predicted to be mostly northeast, we expected some protection from the bank and held close to it. We did indeed get that for a few hours until the wind went northwest putting things in our face. We had mostly high teens with gusts into the 20’s. Not much choice but to tough it out. That is probably the worst combination of winds and seas for Wind Horse. Nothing dangerous (at least for her) – just every third or fourth set would drop us hard. 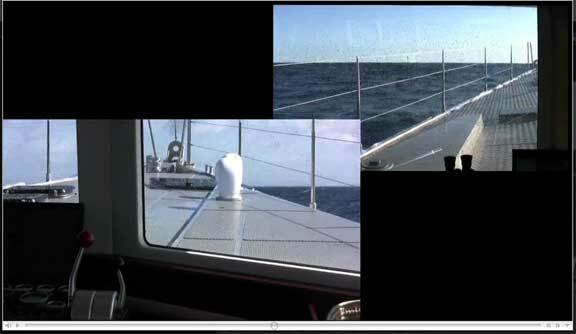 Wind Horse didn’t care – she still did her steady 11 knots. Trying to sleep in the aft cabin, things were really very calm. No big deal other then the noise when we dropped off a wave. Until you have been there, you can’t possibly imagine the kind of confidence these boats inspire. To the extent that the 64 is softer – well – that is simply hard to believe. In the video the spray splashed against the windshield beads up well. Do you use something like Rain-X for that purpose? If so, do you need to reapply often in salt water conditions? Rain X is indeed what we use. It is applied to the windows before each long passage.